The last of the Tirolese Schutzen units, this one is lead by Herr Friedrich Ursprung. Friedrich's men and women wear dark grey coats, pants in shades of brown, and hats in shades of green. Of the two other principal leaders of the Tyrolese, Haspinger, the Capuchin, escaped to Vienna, which Speckbacher also succeeded in reaching, after a series of perils and escapes which are well worth relating. After the dispersal of his troops he, like Hofer, sought concealment in the mountains where the Bavarians sought for him in troops, vowing to "cut his skin into boot-straps if they caught him." He attempted to follow the mountain paths to Austria, but at Dux found the roads so blocked with snow that further progress was impossible. Here the Bavarians came upon his track and attacked the house in which he had taken refuge. He escaped by leaping from its roof, but was wounded in doing so. For the twenty-seven days that followed he roamed through the snowy mountain forests, in danger of death both from cold and starvation. Once for four days together he did not taste food. At the end of this time he found shelter in a hut at Bolderberg, where by chance he found his wife and children, who had sought the same asylum. His bitterly persistent foes left him not long in safety here. They learned his place of retreat, and pursued him, his presence of mind alone saving him from capture. Seeing them approach, he took a sledge upon his shoulders, and walked towards and past them as though he were a servant of the house. His next place of refuge was in a cave on the Gemshaken, in which he remained until the opening of spring, when he had the ill-fortune to be carried by a snow-slide a mile and a half into the valley. It was impossible to return. He crept from the snow, but found that one of his legs was dislocated. The utmost he could do, and that with agonizing pain, was to drag himself to a neighboring hut. Here were two men, who carried him to his own house at Rinn. Bavarians were quartered in the house, and the only place of refuge open to him was the cow-shed, where his faithful servant Zoppel dug for him a hole beneath the bed of one of the cows, and daily supplied him with food. His wife had returned to the house, but the danger of discovery was so great that even she was not told of his propinquity. For seven weeks he remained thus half buried in the cow-shed, gradually recovering his strength. At the end of that time he rose, bade adieu to his wife, who now first learned of his presence, and again betook himself to the high paths of the mountains, from which the sun of May had freed the snow. He reached Vienna without further trouble. Here the brave patriot received no thanks for his services. Even a small estate he had purchased with the remains of his property he was forced to relinquish, not being able to complete the purchase. He would have been reduced to beggary but for Hofer's son, who had received a fine estate from the emperor, and who engaged him as his steward. Thus ended the active career of the ablest leader in the Tyrolean war. Freiherr Franz Dienstag commands the last of the 6 units of Landsturm in my Tyrolese forces. His men (and women) wear light grey coats with pants in shades of brown, and the famous green hats. As the last of the units, they got the "leftovers" when it came to armament... a mixture of scythes, ancient halberds, pitchforks, poleaxes, and awls! Our narrative by Charles Morris continues, with the sad account of Hofer's end. Napoleon was not a man to have sympathy for rebels of any kind, his roots in the French Revolution notwithstanding! His captors treated him with brutal violence. They tore out his beard, and dragged him pinioned, barefoot, and in his night-dress, over ice and snow to the valley. Here he was placed in a carriage and carried to the fortress of Mantua, in Italy. Napoleon, on news of the capture being brought to him at Paris, sent orders to shoot him within twenty-four hours. He died as bravely as he had lived. When placed before the firing-party of twelve riflemen, he refused either to kneel or to allow himself to be blindfolded. "I stand before my Creator," he exclaimed, in firm tones, "and standing will I restore to him the spirit he gave." He gave the signal to fire, but the men, moved by the scene, missed their aim. The first fire brought him to his knees, the second stretched him on the ground, where a corporal terminated the cruel scene by shooting him through the head. He died February 20, 1810. At a later date his remains were borne back to his native alps, a handsome monument of white marble was erected to his memory in the church at Innsbruck, and his family was ennobled. Now, as many of you know, I myself have already authored a scenario book for 1809, intended especially for use with my favored Field of Battle rules. These scenarios are all generic, but especially suited to Shako, and other rules where commands become shaken and demoralized. They will need significant adaptation for most other rules sets, I'd think. So, what else is new in Napoleonic scenario books in that regard? Not a big deal, but not exactly an off the shelf product for most rule sets. However, these books, which are a true labor of love on the part of Michael and his supporting players are meticulously detailed as far as the troops present and their day of battle strengths, as well as the maps and terrain. If you look art the listing of the scenarios, they range from the huge and well known, to the small and quite obscure. Ordering all four (!) of the 1809 scenario books together saved on postage. Yep, that's my story and I am sticking to it! There are enough scenarios here to play an 1809 game a month and continue for six years! As a bonus, Michael threw in a copy of his first, well known scenario book at a discounted price. We had played his Austerlitz scenario with Shako 2 with the HAHGS group way back circa 2007, and it worked very well indeed. I look forward to trying many of these out in the years to come. If you are looking for some inspirational and very useful Napoleonic scenario material, you can hardly go wrong with these. Cost is $32 - $34 Canadian per book. My inquiries lead to at least a dozen great exchanges and discussions over the next week or two, as well as the books, which were mailed out the same day and received within just a few more days. Michael doesn't ask for payment until the books are received, and and you agree they are well worth the price. He provided me with a number of sample pdf scenarios to review before I ordered as well. I suggested to him that he consider releasing these as pdf files, which would save money and time on all ends, but for now he plans to stick with print format only. As I said earlier, these are a true labor of love, and making money from them is really not an important concern to Michael. Oh, and Michael has literally hundreds more scenarios from different years and theaters of the Napoleonic Wars in development, and will likely gladly chat with you about almost any of them! He is a gentleman and a scholar in the truest sense of those words. The penultimate Schutzen unit is this one lead by Ernst Stripsenjoch. They wear light grey jackets with pants in shades of green, and hats in shades of brown. Enst is a loud, boisterous fellow. He reminds one of that guy in your high school gym class who'd toss his athletic supporter at someone near him as he headed off to the showers! The freedom of the Tyrol was not to last long. The treaty of Vienna, between the Emperors of Austria and France, was signed. It did not even mention the Tyrol. It was a tacit understanding that the mountain country was to be restored to Bavaria, and to reduce it to obedience three fresh armies crossed its frontiers. They were repulsed in the south, but in the north Hofer, under unwise advice, abandoned the anterior passes, and the invaders made their way as far as Innsbruck, whence they summoned him to capitulate. During the night of October 30 an envoy from Austria appeared in the Tyrolese camp, bearing a letter from the Archduke John, in which he announced the conclusion of peace and commanded the mountaineers to disperse, and not to offer their lives as a useless sacrifice. The Tyrolese regarded him as their lord, and obeyed, though with bitter regret. A dispersion took place, except of the band of Speckbacher, which held its ground against the enemy until the 3rd of November, when he received a letter from Hofer saying, "I announce to you that Austria has made peace with France, and has forgotten the Tyrol." On receiving this news he disbanded his followers, and all opposition ceased. The war was soon afoot again, however, in the native vale of Hofer, the people of which, made desperate by the depredations of the Italian bands which had penetrated their country, sprang to arms and resolved to defend themselves to the bitter end. They compelled Hofer to place himself at their head. For a time they were successful. But a traitor guided the enemy to their rear, and defeat followed. Hofer escaped and took refuge among the mountain peaks. Others of the leaders were taken and executed. The most gallant among the peasantry were shot or hanged. There was some further opposition, but the invaders pressed into every valley and disarmed the people, the bulk of whom obeyed the orders given them and offered no resistance. The revolt was quelled. Hofer took refuge at first, with his wife and child, in a narrow hollow in the Kellerlager. This he soon left for a hut on the highest alps. He was implored to leave the country, but he vowed that he would live or die on his native soil. Discovery soon came. A peasant named Raffel learned the location of his hiding-place by seeing the smoke ascend from his distant hut. He foolishly boasted of his knowledge; his story came to the ears of the French; he was arrested, and compelled to guide them to the spot. Two thousand French were spread around the mountain; a thousand six hundred ascended it; Hofer was taken. These Landsturm lead by Luis Donnerstag wear dark grey coats, green pants, and brown hats. Some on line searching found some additional English language accounts of the War in the Tyrol that are out of copyright, and similarly romantic to Morris, whose account is not yet concluded. At first the peasantry had been so discouraged by their abandonment by the Austrians that a great number of them bad gone to their homes, but at the earnest solicitation of their leaders they again rallied, and hostilities re-opened on August 4th. A column of French and Bavarians were crossing the bridge at Laditch where the high road from Balsano to the capital crosses the river Eisach. The Tyrolese under Haspinger occupied the overhanging woods, and when the troops were well in the defile they rained bullets and rocks upon them without showing themselves. Men were falling at every step, and the crushing rocks tore lanes through the ranks. “Now, in the name of the Father, Son and Holy Ghost, cut loose.” And at the word, a hinge platform of tree trunks, upon which tons of rocks had been collected, was suddenly cut loose, and the whole mass descended like an avalanche upon the soldiery, sweeping whole companies away and leaving a trail of mangled bodies behind it. Despite this terrible catastrophe the column pushed its way on towards the bridge, only to find it in flames, and a raging torrent barring their further progress. They retreated to their starting point harassed all the way by the invisible enemy and with a loss of 1,200 men. Dark grey coats, pants in shades of green and hats in shades of brown are used for the raiment of this unit. Meanwhile, Speckbacher and the Capuchin kept up hostilities successfully on the eastern frontier. Haspinger wished to invade the country of their foes, but was restrained by his more prudent associate. Speckbacher is described as an open-hearted, fine-spirited fellow, with the strength of a giant, and the best marksman in the country. So keen was his vision that he could distinguish the bells on the necks of the cattle at the distance of half a mile. His son Anderle, but ten years of age, was of a spirit equal to his own. In one of the earlier battles of the war he had occupied himself during the fight in collecting the enemy's balls in his hat, and so obstinately refused to quit the field that his father had him carried by force to a distant alp. During the present conflict, Anderle unexpectedly appeared and fought by his father's side. He had escaped from his mountain retreat. It proved an unlucky escape. Shortly afterwards, the father was surprised by treachery and found himself surrounded with foes, who tore from him his arms, flung him to the ground, and seriously injured him with blows from a club. But in an instant more he sprang furiously to his feet, hurled his assailants to the earth, and escaped across a wall of rock impassable except to an expert mountaineer. A hundred of his men followed him, but his young son was taken captive by his foes. The king, Maximilian Joseph, attracted by the story of his courage and beauty, sent for him and had him well educated. 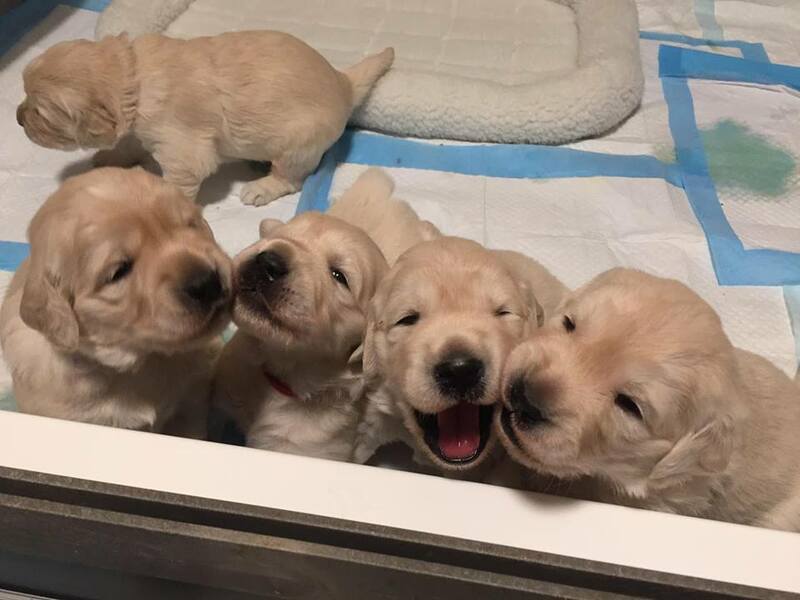 Gratuitous Puppy picture #2; they are three weeks old. Gratuitous Puppy Picture #3. Their eyes an ears are open, and they are starting to bark. Tiroler Schutzen #6, "Anton Kerschbaum"
The last of the "Green Brigade" is this unit of Schutzen, lead by Herr Anton Kerschbaum. Olive Drab coats, yellow shirts with scarlet braces, hats in shades of Brown and pants in shades of Grey are the order of the day for their attire. Note the green and white rosettes on their hats. A second corps d'armee advanced up the valley of the Inn as far as the bridges of Pruz. Here it was repulsed by the Tyrolese, and retreated under cover of the darkness during the night of August 8. The infantry crept noiselessly over the bridge of Pontlaz. The cavalry followed with equal caution but with less success. The sound of a horse's hoof aroused the watchful Tyrolese. Instantly rocks and trees were hurled upon the bridge, men and horses being crushed beneath them and the passage blocked. All the troops which had not crossed were taken prisoners. The remainder were sharply pursued, and only a handful of them escaped. The other divisions of the invading army met with a similar fate. Lefebvre himself, who reproached the Saxons for their defeat, was not able to advance as far as they, and was quickly driven from the mountains with greatly thinned ranks. He was forced to disguise himself as a common soldier and hide among the cavalry to escape the balls of the sharp-shooters, who owed him no love. The rear-guard was attacked with clubs by the Capuchin and his men, and driven out with heavy loss. During the night that followed all the mountains around the beautiful valley of Innsbruck were lit up with watch-fires. In the valley below those of the invaders were kept brightly burning while the troops silently withdrew. On the next day the Tyrol held no foes; the invasion had failed. Hofer placed himself at the head of the government at Innsbruck, where he lived in his old simple mode of life, proclaimed some excellent laws, and convoked a national assembly. The Emperor of Austria sent him a golden chain and three thousand ducats. He received them with no show of pride, and returned the following naive answer: "Sirs, I thank you. I have no news for you to-day. I have, it is true, three couriers on the road, the Watscher-Hiesele, the Sixten-Seppele, and the Memmele-Franz, and the Schwanz ought long to have been here. I expect the rascal every hour." Next in the "green" division of Tirolese rebels is this unit raised by Ferdinand Mittwoch, and armed with pitchforks. I found this interesting flag design in the course of a search for Tyrolean flags using German words. The "flames" around the edges are of course very "Austrian" in appearance, and it has the red eagle of Tirol in the center. If I recall correctly, the actual flag dates back to the 17th century! I used the online image, edited in MS paint to make the flag, and then "enhanced" the printed version with paint. The pinkish hue to the white areas in the border is present in the original images. The aid came. [Marechal] Lefebvre, in his brutal fashion, plundered and burnt as he advanced, and published a proscription list instead of the amnesty promised. The natural result followed. Hofer persuaded the bold Capuchin to leave his monastery, and he, with two others, called the western Tyrol to arms. Hofer raised the eastern Tyrol. They soon gained a powerful associate in Speckbacher, who, conscience-stricken by Hofer's reproach, had left the Austrians and hastened back to his country. The invader's cruelty had produced its natural result. The Tyrol was once more in full revolt. With a bunch of rosemary, the gift of their chosen maidens, in their green hats, the young men grasped their trusty rifles and hurried to the places of rendezvous. The older men wore peacock plumes, the Hapsburg symbol. With haste they prepared for the war. Cannon which did good service were made from bored logs of larch wood, bound with iron rings. Here the patriots built abatis; there they gathered heaps of stone on the edges of precipices which rose above the narrow vales and passes. The timber slides in the mountains were changed in their course so that trees from the heights might be shot down upon the important passes and bridges. All that could be done to give the invaders a warm welcome was prepared, and the bold peasants waited eagerly for the coming conflict. From four quarters the invasion came, Lefebvre's army being divided so as to attack the Tyrolese from every side, and meet in the heart of the country. They were destined to a disastrous repulse. The Saxons, led by Rouyer, marched through the narrow valley of Eisach, the heights above which were occupied by Haspinger the Capuchin and his men. Down upon them came rocks and trees from the heights. Rouyer was hurt, and many of his men were slain around him. He withdrew in haste, leaving one regiment to retain its position in the Oberau. This the Tyrolese did not propose to permit. They attacked the regiment on the next day, in the narrow valley, with overpowering numbers. Though faint with hunger and the intense heat, and exhausted by the fierceness of the assault, a part of the troops cut their way through with great loss and escaped. The rest were made prisoners. The story is told that during their retreat, and when ready to drop with fatigue, the soldiers found a cask of wine. Its head was knocked in by a drummer, who, as he stooped to drink, was pierced by a bullet, and his blood mingled with the wine. Despite this, the famishing soldiery greedily swallowed the contents of the cask. Next up is another unit of Tirolese Schutzen, this group lead by Herr Wolfgang Iselsberg. Their order of dress is grass green jackets, pants in shades of brown and hats inn shades of grey. The freedom thus gained by the Tyrolese was not likely to be permanent with Napoleon for their foe. The Austrians hastened to the defence of the country which had been so bravely won for their emperor. On the other side came the French and Bavarians as enemies and oppressors. Lefebvre, the leader of the invaders, was a rough and brutal soldier, who encouraged his men to commit every outrage upon the mountaineers. For some two or three months the conflict went on, with varying fortunes, depending upon the conditions of the war between France and Austria. At first the French were triumphant, and the Austrians withdrew from the Tyrol. Then came Napoleon's defeat at Aspern, and the Tyrolese rose and again drove the invaders from their country. In July occurred Napoleon's great victory at Wagram, and the hopes of the Tyrol once more sank. All the Austrians were withdrawn, and Lefebvre again advanced at the head of thirty or forty thousand French, Bavarians, and Saxons. The courage of the peasantry vanished before this threatening invasion. Hofer alone remained resolute, saying to the Austrian governor, on his departure, "Well, then, I will undertake the government, and, as long as God wills, name myself Andrew Hofer, host of the Sand at Passeyr, and Count of the Tyrol." He needed resolution, for his fellow-chiefs deserted the cause of their country on all sides. On his way to his home he met Speckbacher, hurrying from the country in a carriage with some Austrian officers. "Wilt thou also desert thy country!" said Hofer to him in tones of sad reproach. Another leader, Joachim Haspinger, a Capuchin monk, nicknamed Redbeard, a man of much military talent, withdrew to his monastery at Seeben. Hofer was left alone of the Tyrolese leaders. While the French advanced without opposition, he took refuge in a cavern amid the steep rocks that overhung his native vale, where he implored Heaven for aid. 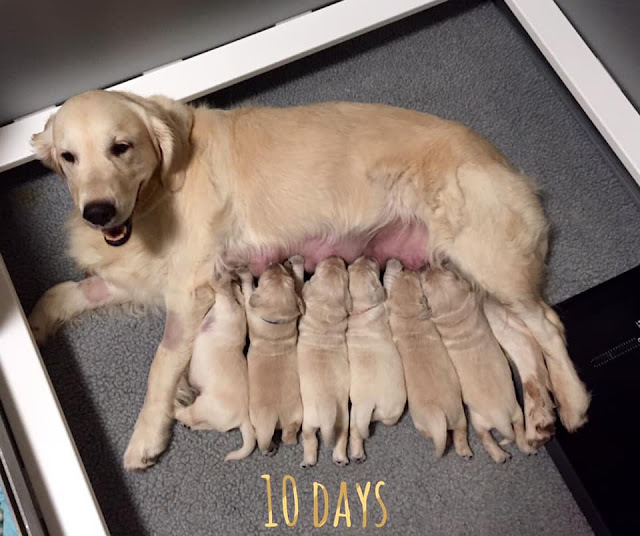 2 weeks ago, my daughter, Kristie's dog, Annie gave birth to a litter of six puppies. They were born by Cesarean section, so we all helped resuscitate them. 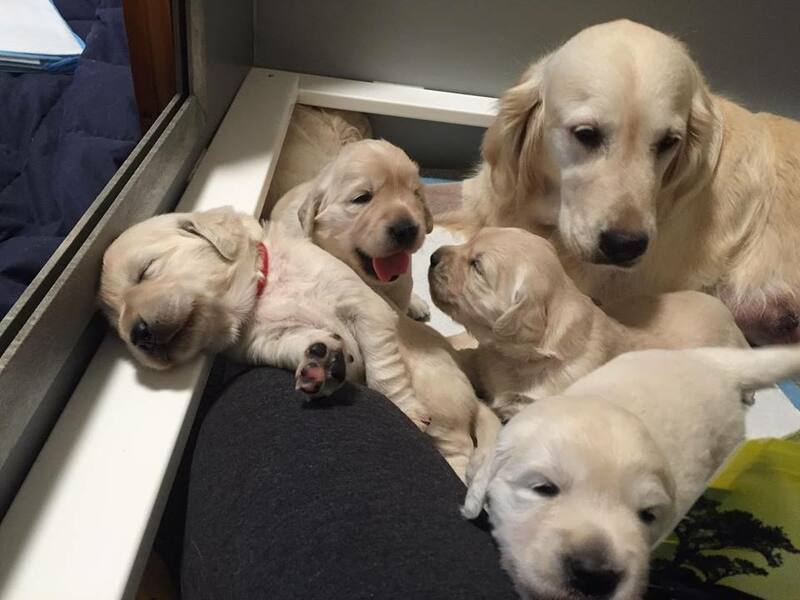 Here are mom and pups at 10 days old. 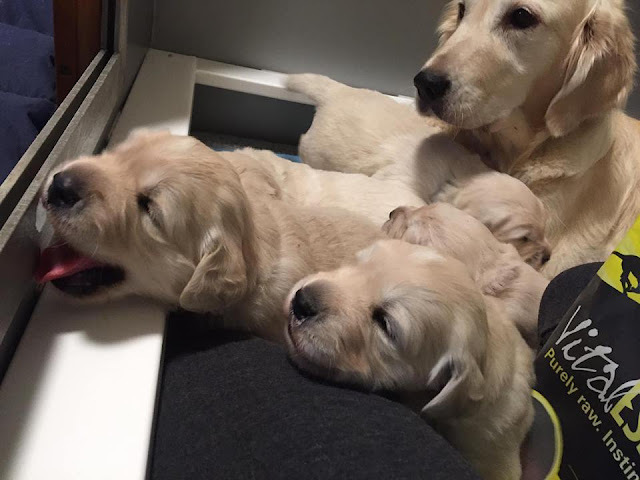 Annie is a very attentive mother! 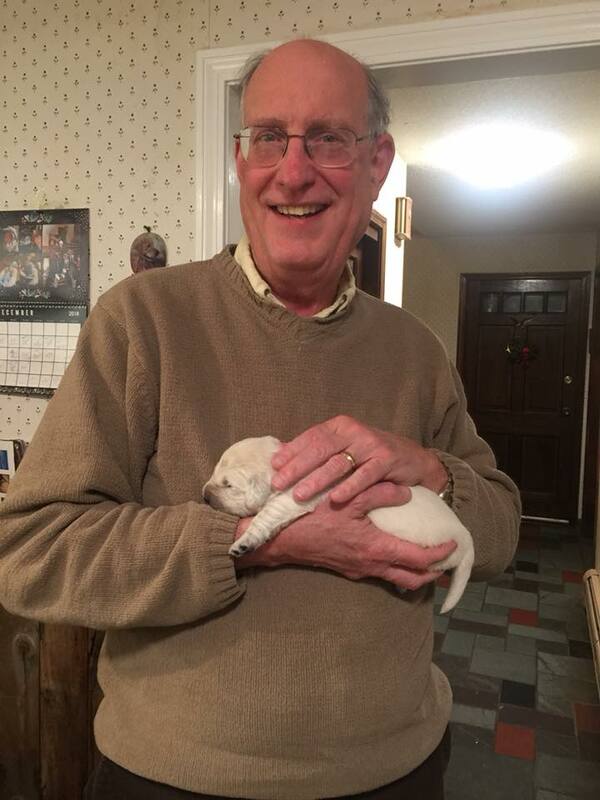 Here I am holding one of the pups, who is happy to sleep in my arms. They are starting to really like being held and petted. This is probably the one that we will keep. Kristie will keep another, and the other four are all spoken for., and will go to their new homes at about 9 weeks of age. Tiroler Schuitzen #4, "Uwe Holzleiten"
Tiroler Schützen #3 "Otto Grießen"